Moore’s wardrobe was also different. 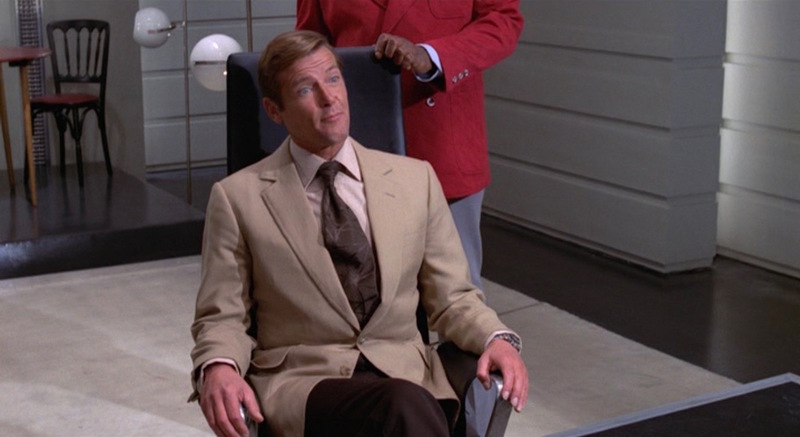 Where Connery primarily had two looks – a dark suit or a casual collared shirt and trousers – Moore began diversifying Bond’s attire. 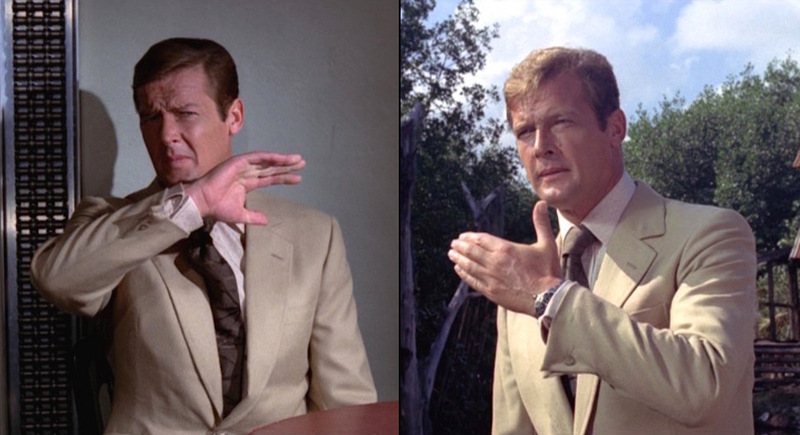 If a situation called for a safari suit, dammit, Moore was gonna wear one! Live and Let Die is underrated in that it did what Casino Royale was lauded for thirty years later; the screenwriters kept the nexus of the main story, updating it for the time period. Previous films were made close enough to the time that the novels were written that the stories hardly needed updating. In 1973, the novel Live and Let Die was almost twenty years old. A story about coin-smuggling gangsters from Harlem would hardly be compelling for 1973, so it was updated to a heroin-smuggling ring with shout-outs to popular films at the time such as Dirty Harry, Bullitt, and the increasing popular Blaxploitation fare such as Shaft and Coffy. The movie itself is admittedly weird. The voodoo, backwards sexism, blatant racism, the ’70s in general… but it IS enjoyable. The new pace is quick and a refreshing change that is better suited to the winking Moore than the bloated Connery of Diamonds are Forever. Yaphet Kotto was also a charmingly great double villain as Kananga/Mr. Big (spoiler alert), despite how badly-written the character was, setting the stage for several easily-escapable “death traps” that Mike Myers would later capitalize on parodying as Austin Powers. Kananga even says to Bond “Let me tell you exactly how it works” before sending Bond to be slowly dipped into a pool of sharks while loosely tied to a a metal pole and Jane Seymour. A review from The Incredible Suit highlights ten instances in which Kananga’s hubris (or poor writing) failed to kill Bond. Live and Let Die was a halfway mark for the Bond series before things got too comical… Well, almost before things got too comical. Bond fans, especially sartorial enthusiasts, protest some of Moore’s looks, citing too many safari suits, leisure suits, and “old man” suits of the ’80s. 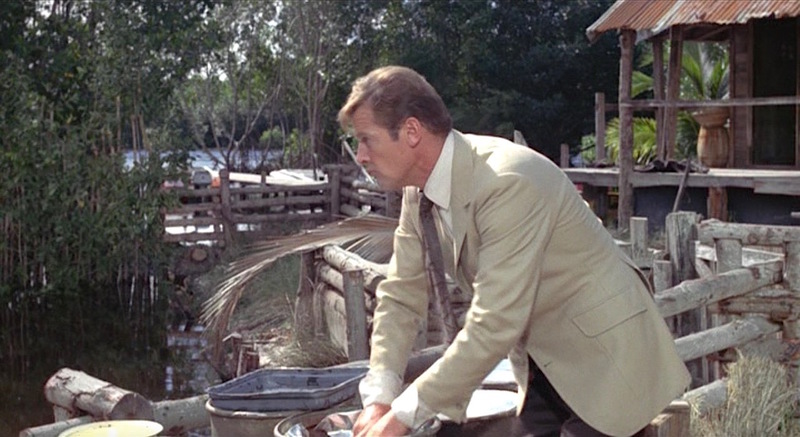 However, Moore only wore safari suits when on missions in warm climates (where they were both practical and fashionable in the ’70s), his only real leisure suit was the denim gear he sports while fishing in Live and Let Die, and his “old man” suits were actually finely tailored Douglas Hayward suits for a man who was, indeed, growing older. Most Moore critics fail to mention that he looked very fashionable for his era, as did the Bonds before and after him. The scale of sartorial timelessness is more an indicator of the times than of the man. 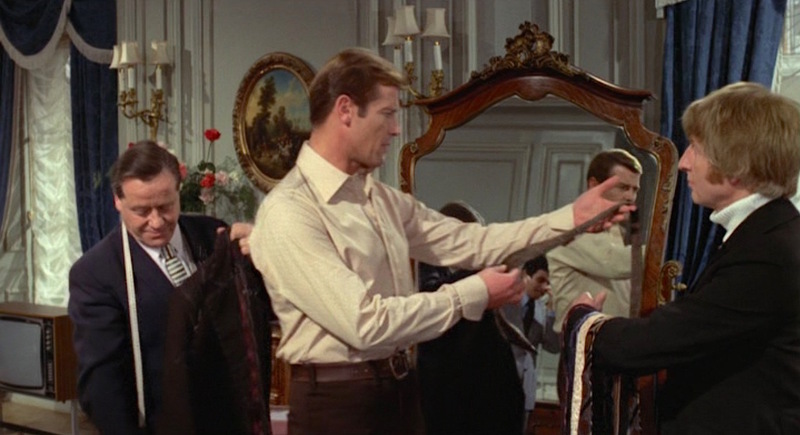 As a treat for sartorial bloggers, Live and Let Die includes a scene of Bond getting tailored. There was a similar scene in the novel of Bond being measured for suits in his New York hotel room, but the film shows Bond in command rather than the literary Bond being forced to submit to “Americanization” at the hands of Leiter and the CIA. Lucky for all of us, the outfit Bond is choosing in the tailor scene for the film is the very one I plan on covering today. For his brief venture into New Orleans, Moore’s Bond wears a beige sport coat, a tie and trousers, and – most appropriately – a pair of crocodile shoes. The shoes are the most un-Bond-like of the attire, but they certainly have their place, as the scene goes on to show. The beige sport coat has a complex basketweave pattern, which Matt Spaiser has deduced is likely a linen and silk blend. (For anyone who appreciates good style, check out Matt’s blog The Suits of James Bond. Immediately.) The jacket also has a welted breast pocket and flapped hip pockets, slanted like one typically would see on a hacking jacket. Mr. Bond finds himself face to face with Mr. Big. The single-breasted jacket has swelled-edge notch lapels of a more timeless width than one associates with the 1970s, which roll to two light brown horn buttons. There is also a unique single link-button on each flared cuff. The link-button sport coat cuffs were a distinctively Moorean feature. 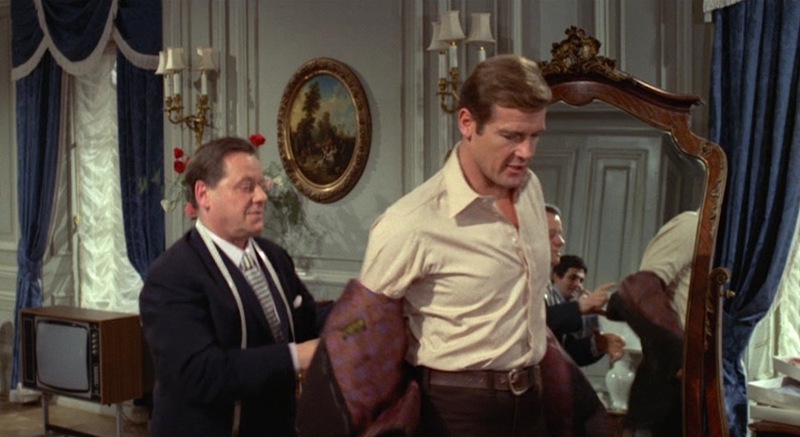 Also, notice the shirt’s turnback cuffs – one of the few callbacks to Connery’s Bond style. As a final note, Bond instructs his tailor: “Don’t forget the double vents.” That would be kind of a big thing for a tailor to forget, wouldn’t it? As Sir Roger requested on his suit jacket, this jacket does indeed have very long rear vents, giving him a very handy bit of mobility when hopping from crocodile to crocodile. The sport coat is paired with dark brown flat front trousers, providing a pleasant contrast to the pale brown in the beige coat. They rise high on Moore’s waist, and his height slightly offsets the ’70s-flared plain-hemmed bottoms. The two jetted back pockets close with a button. Each front pocket is a slit at the waistline, just below the belt, resembling two large coin pockets rather than more traditional side pockets, providing a cleaner look. The trousers also have belt loops, transitioning between the side-adjuster trousers of the Connery era in to the Gucci belt-wearing Moore era. The belt itself is thick dark brown leather with a large square brass single-prong buckle in the front. The tag inside the jacket looks like it belongs to Cyril Castle, Moore’s tailor in his earlier Bond films. Honestly, I thought it was pretty clever too. 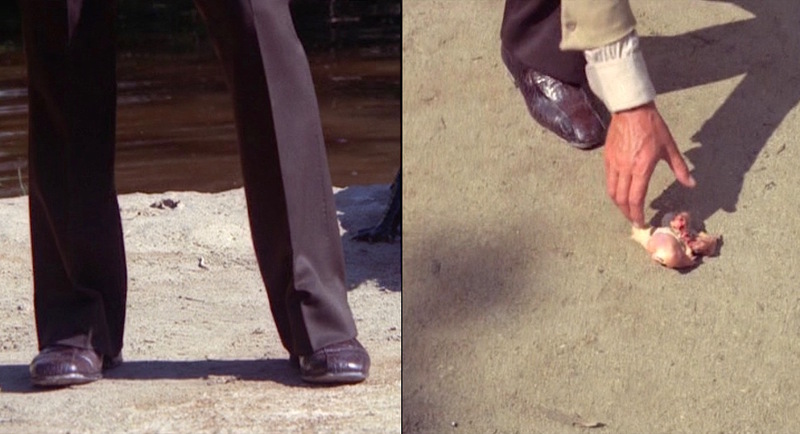 Unfortunately, the filmmakers missed an opportunity when Bond comments on the crocodiles as “potential overnight bags” while not even mentioning his shoes! Bond pairs the shoes with thin black dress socks. That crocodile might not have been so mad if Bond wasn’t wearing his nephew on his feet. 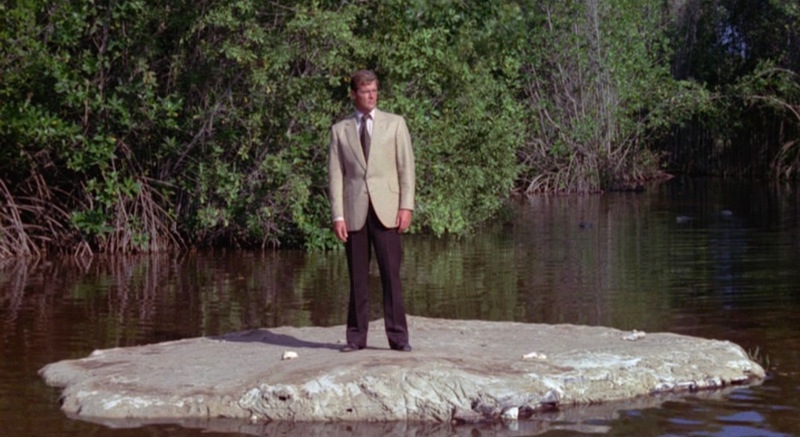 Bond wears a unique shirt from London shirtmaker Frank Foster with a subtly scattered tan pattern on an ecru ground. The shirt has a substantial semi-spread collar, though the length of the collar points is nowhere near the infamous disco-era shirt collars, and it has a front placket and two-button turnback cuffs (or “cocktail cuffs”). Bond takes stock of his latest shirt. 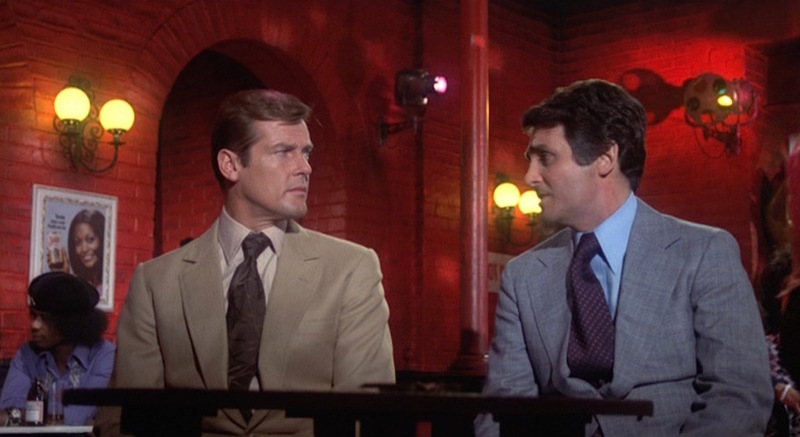 While talking with his tailor, Bond is given a variety of ties to critique. Moore beautifully describes one of the ties he is being offered as “a little frantic” before deciding on keeping the other three, tying a brown abstract silk one around his neck with a loose four-in-hand knot. 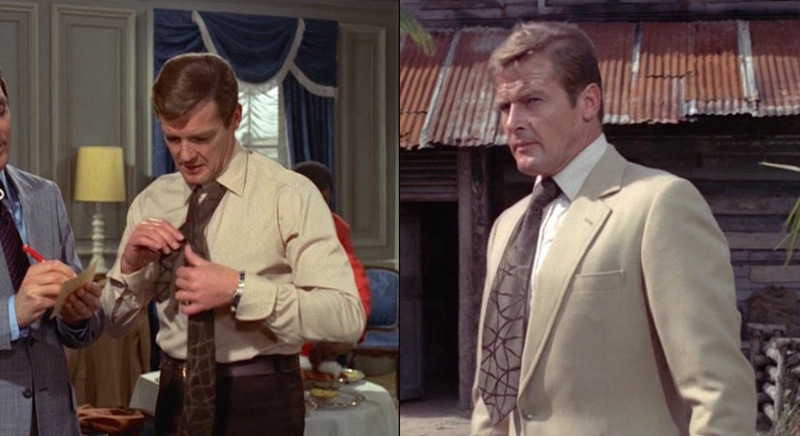 The tie shows indications of 1970s width, but Moore’s ties never get any wider than this and it is still a respectable length *cough*Sean Connery’s pink tie in Diamonds are Forever*cough*. Finally, the most life-saving part of Bond’s wardrobe is his “particularly handsome watch,” a stainless Rolex Submariner 5513 diver with a black dial, black rotating bezel, and stainless Oyster-style link bracelet. Also notice the unique shirting and the basket weave of the jacket. Having almost ended his life in a previous scene by giving Kananga a chance to fool the impossibly attractive Solitaire, the watch tried to apologize by using its magnetic powers to attract a rowboat to Bond… but failed again. Rolex must have been pretty stoked about their product placement in this Bond film until they realized that their watch landed Bond in some hot water not only once but twice. 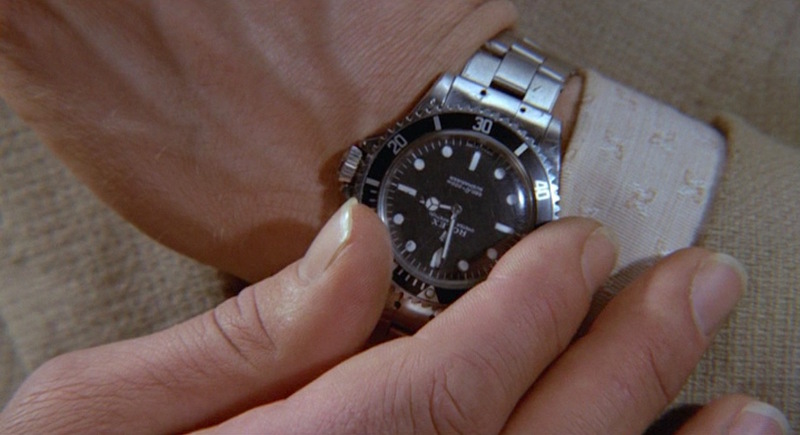 It’s worth noting that a somewhat frequent continuity error throughout the film finds 007’s Submariner replaced in non-closeup scenes with a different steel watch, which Bond fans have identified as a Tissot Visodate Seastar PR516 that was likely Moore’s personal timepiece. 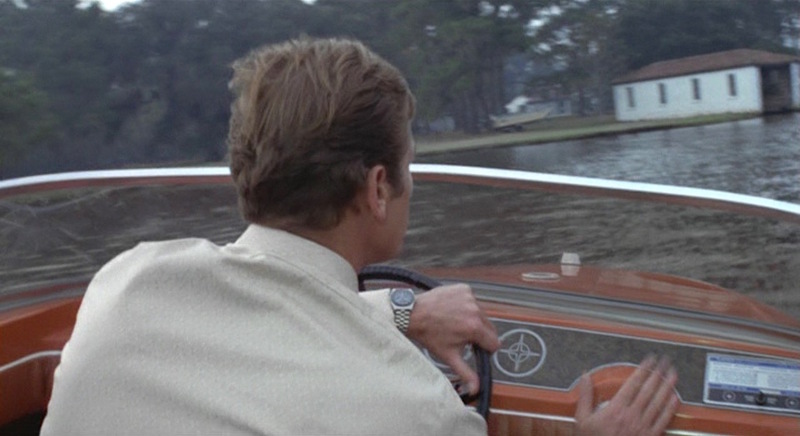 Bond evidently found time during the boat chase to swap out his Submariner for a different watch. These scenes show off a lot of what differentiated Moore’s Bond from Connery’s. More of a lover than a fighter, Moore relied on wit to win over audiences. 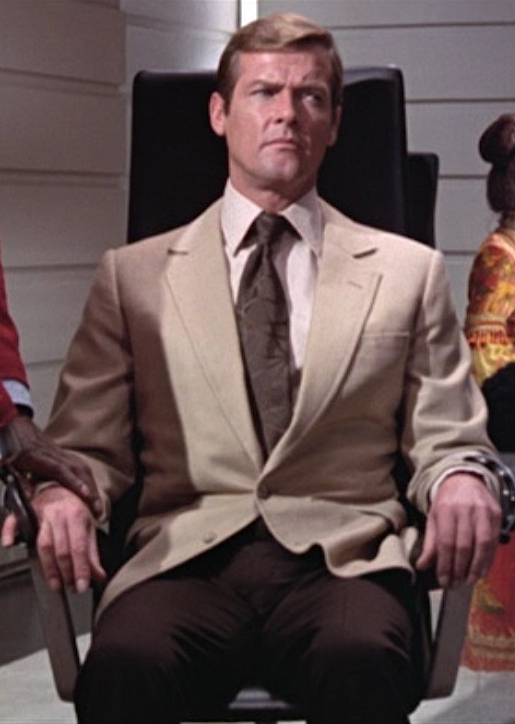 He has a lot of great moments of dry observations and quips in Live and Let Die before the filmmakers thought, “Hey, a pigeon doing a double take is exactly what James Bond fans want!” Moore’s Bond handles the questioning from Kananga with aplomb, exchanging witticisms, figuring out the plot, and pushing Kananga’s buttons simultaneously. It could be this coolness under fire that saved his pinky. Also, learn how to drive a speedboat. Multiple speedboats, in fact. Make sure you can drive them in water and over land. 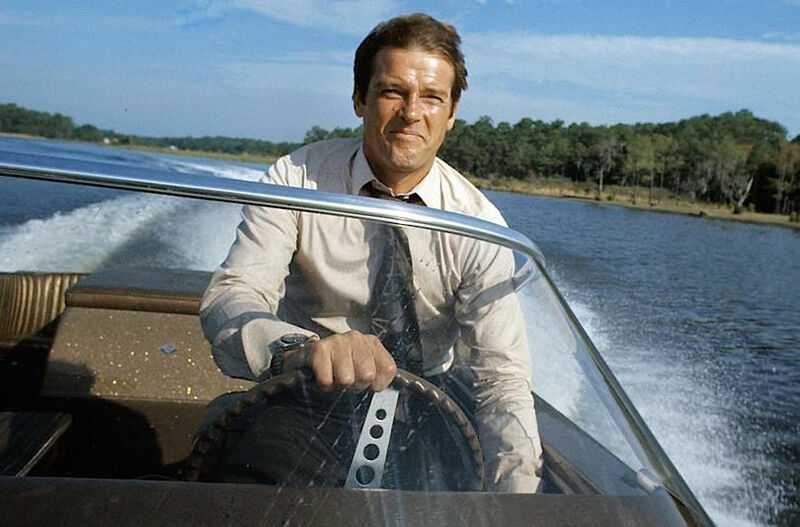 Liven up summer picnics by stealing multiple speedboats. In the book, Bond and CIA pal Felix Leiter had pranced through Harlem, drinking Scotch and sodas everywhere they went. 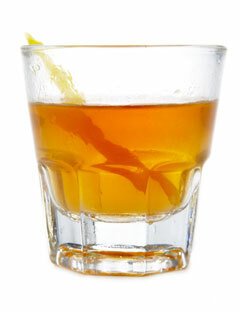 However, with the added move to New Orleans for the movie, the filmmakers also added a nod to the Sazerac, a very New Orleans cocktail. Or they could’ve just done like the guy behind them and settled for bottles of Bud heavy. A few months ago, I played a small role in a local Pittsburgh production of the Crouse & Lindsay play State of the Union. One character in the show is notable for drinking Sazeracs – she is indeed from Louisiana – and the cocktail gets quite a reputation in the play’s third act, referred to as “buzz bombs” and one character being warned that a Sazerac would “light up your vest buttons!” This line always got some laughter, but anyone who’s ever had a well-made Sazerac knows that this is indeed the case. * Bond and Felix wisely avoided getting Hurricanes from Pat O’Brien’s. The drinks are delicious, but not conducive to serious investigations. Referred to as one of the earliest American cocktails, right up there with the venerable Mint Julep and Old Fashioned, the Sazerac isn’t a cocktail easily whipped up from your friend’s bar. Requiring rye (which has unfortunately fallen by the way side in recent years), bitters, simple syrup, and – most difficult – absinthe, one has to expect to make Sazeracs to have the proper ingredients. That includes two glasses for one drink. First, the glass needs to be properly chilled. In this case, it would be an old fashioned glass or a rocks glass. Pack the glass with ice and water to chill it. Get an identical glass and muddle together 3 dashes of Peychaud’s (not Angostura) bitters and either a sugar cube or 1 teaspoon of simple syrup. Pour 2 ounces of rye over this. For some reason, I have best results with Old Overholt although there are superior ryes out there. Stir it up. You now have one glass of rye, bitters, and sugar. Get that other glass now – the one that’s been chilling. Empty the ice. Pour in a splash of absinthe (or Herbsaint, an anise-flavored liquor made by the Sazerac Company) and swirl it around, coating the sides of glass. Discard any excess absinthe/Herbsaint; all that should be left in the glass is whatever was lucky enough to stick to the sides while coating it. Okay, now you’re ready! Pour the rye, bitters, and sugar mixture from that glass into the absinthe-coated chilled glass. Twist a lemon peel over the drink and – if you so choose – rub the peel over the rim of the glass. Drop the peel into the cocktail and drink. It may have taken you ten minutes to make and one minute to drink, but it’ll take about a day to get over it. Enjoy irresponsibly. 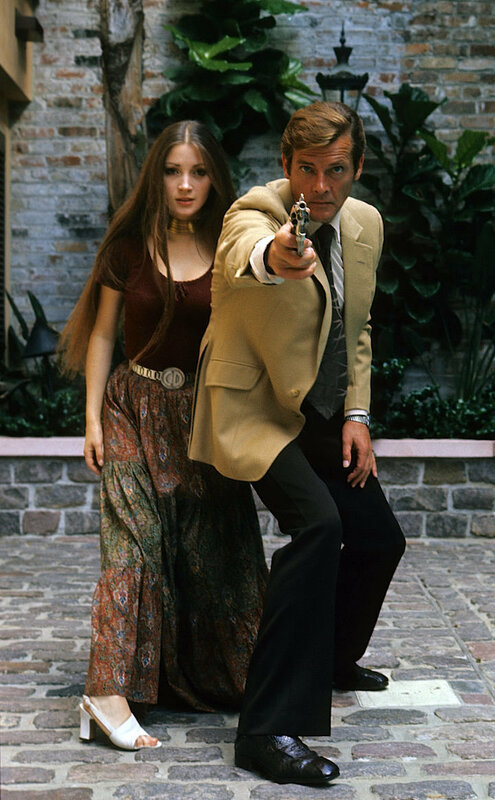 Jane Seymour and Roger Moore on location for Live and Let Die in Kingston, Jamaica, 1973. Photo by Anwar Hussein. This would be a very easy one to update for a fresh, modern earthtone look. Check out the movie and kick back with a Sazerac, being glad you don’t have to hop over any crocodiles today. Moore was the Bond that I grew up with and, while he’s not my favourite these days, I have to give him credit for keeping the Bond franchise going through the Seventies and Eighties. I never paid much attention to his threads in his films, so thanks for the nice screen-caps showing the detail in his wardrobe. Ah, yes, everyone remembers their first Bond… Mine was actually TMWTGG as well, at a friend’s birthday party. I thought it was the coolest thing until that slide whistle effect during the AMC chase. Even at the young age of nine, I knew a great car stunt was blemished. Moore gets a tough rap, especially for the silly moments like that, but you’re right, he certainly kept popular what could’ve been a dying franchise (and what Lazenby thought was surely outdated). From what I understand, his 12 years in Bond’s shoes gave him a lifetime’s worth of stories to tell. I greatly look forward to reading his memoirs one day. Keep your hopes up for that Submariner 5513 – You’ve got a beautiful selection of timepieces, but that would certainly take the cake! I appreciate the kind words! I’m not sure why, but the clothes always stuck for me. At least “TMWTGG” has the best Bootlegger’s Turn I’ve ever seen in a film. That Rambler Hornet was a little monster.